Limited to 300 units, the “30 Jahre M5” is the most powerful production M5 ever built. BMW is celebrating the 30th birthday of the M5 by unveiling the most powerful variant of the potent sedan it’s ever built. Limited to just 300 units, the BMW M5 “30 Jahre M5” (30 years of the M5) is based on the M5 Competition and comes with a revised 4.4-liter twin-turbo V8 rated at 592 hp and 516 lb-ft of torque. The additional 25 hp and 15 lb-ft was achieved by tweaking the ECU and increasing the turbocharger boost pressure. Power is sent to the rear wheels via the M5’s seven-speed dual clutch, albeit one with new software mapping. The result is a 0-62 mph sprint time of 3.9 seconds and a top speed limited to 199 mph when combined with the optional M Driver’s Package. That makes it the fastest production M5 ever. The Competition pack also offers firmer springs and dampers, a 10 mm lowered suspension, reprogrammed M Dynamic Mode, and two-tone 20-inch alloys. All 300 examples will wear an Individual Frozen Dark Silver paint job with dark chrome accents, and comes with a black interior swathed in Merino leather, Alcantara, aluminum trim and special badging. 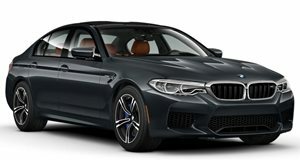 Priced at $138,275, just 30 units of the 30th Anniversary Edition M5 are bound for the US with buyers receiving a day at M Driving School in Palm Springs, California.